So today is a very special day because as of right now I have officially written 100 BLOG POSTS!!!!!!!!!!!!!!!!!!!!!!!!!!!!!!!!!!!!!!!!!!!!!!!!!!!!!!!!!!!!!!!!!!!!!!!!!! This is exciting. I feel like a little kid who has had too much sugar. I’m pretty psyched that the blog has continued for this long and that I’ve managed to write this much without (I hope) compromising the integrity of the writing itself. Even though I’ve got a long way to go, I’ve learned a ton about blogging and I’ve really enjoyed it thus far. Doesn’t it feel like just yesterday I didn’t even understand how to properly use a tag? I hope this list gave you a chuckle. Thanks so much for being a fabulous reader and/or subscriber. 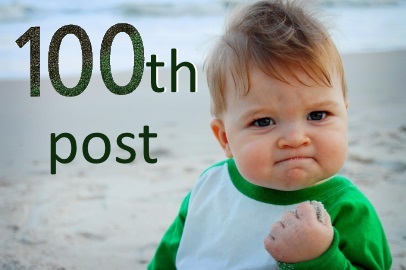 Here’s to at least 100 more posts!